Deluxe Framed Maps of Ireland from the mid to late 1800's. Cassini is delighted to offer you our stunning range of historical Ordnance Survey maps of Ireland. Simply search for the area you are interested in, buy and have it professionally framed and posted to your door. The landscape of your chosen period revealed in all its detail. 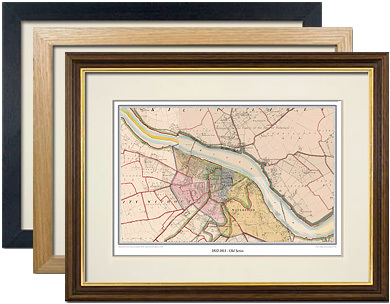 Cassini maps presented in a frame make ideal gifts for anyone with an interest in the history of their area. Choose from several map series at a range of scales ranging from the early 1800s to the present day. Whatever your interest in the past our historical maps are invaluable works of reference. Ideal for personalised decorative maps centred on the location of your choice.